Io 4K Plus provides two Thunderbolt 3 ports for true Thunderbolt flexibility. Thunderbolt 3 doubles the speed of the previous Thunderbolt 2 standard with up to 40 Gps of throughput and utilizes the universal USB-C connection standard for true simplicity over a single cable and port for today's leading Mac and PC workstations and laptops, ideal for Video and Audio I/O as provided by the Io 4K Plus. Io 4K Plus provides this support for your 4K/UltraHD/2K and HD HDR pipelines to HDMI compatible displays in software v14 with HLG and HDR 10 support with HDR Infoframe metadata, in accordance with HDMI 2.0a/CTA-861.3 and HD. v14.2 Desktop Software offers HDR input from HDMI 2.0 input for capturing PlayStation and PlayStation Pro game play and more. 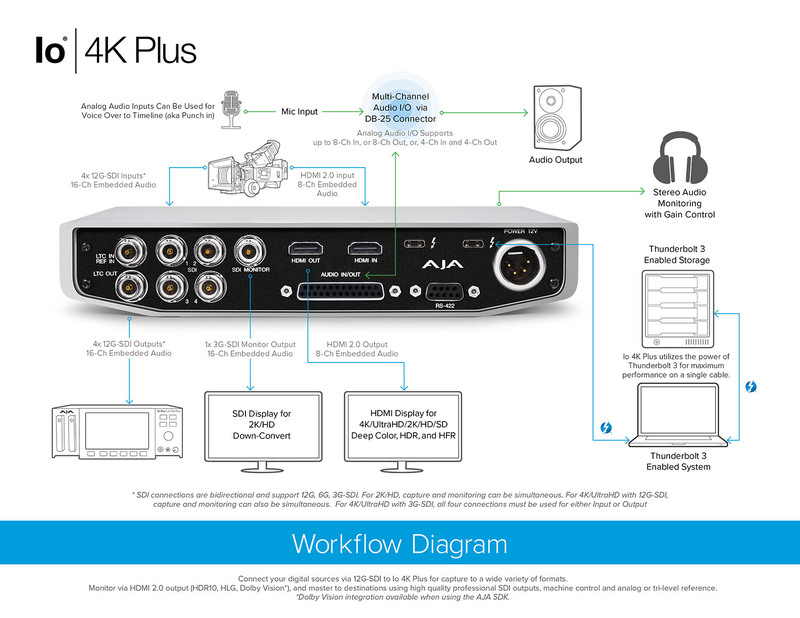 Connect your digital sources via 12G-SDI to Io 4K Plus for capture to a wide variety of formats. Monitor via HDMI 2.0 output (HDR10, HLG, Dolby Vision*), and master to destinations using high quality professional SDI outputs, machine control and analog or tri-level reference. *Dolby Vision integration available when using the AJA SDK. Io 4K Plus can be locked to an external reference for integration into larger productions, or feed LTC in and out to ensure footage captured with Io 4K has the proper timecode.